Holochroal eyes of the Asaphoid trilobite Isotelus Although they were not the first animals with eyes, trilobites developed one of the first sophisticated visual systems in the animal kingdom. 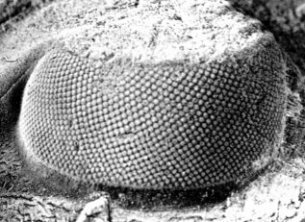 The majority of trilobites bore a pair of compound eyes (made up of many lensed units). They typically occupied the outer edges of the fixigena (fixed cheeks) on either side of the glabella, adjacent to the facial sutures. At least one suborder of trilobites, the Agnostina, are thought to be primarily eyeless. None have ever been found with eyes. In contrast, a few secondarily eyeless species (in which a clear evolutionary trend toward reduced eye size with eventual disappearance of eyes altogether) have developed within several groups, even those known for large, well-developed eyes (e.g., Phacopina). Compound eyes in living arthropods such as insects are very sensitive to motion, and it is likely that they were similarly important in predator detection in trilobites. It has also been suggested that stereoscopic vision was provided by closely spaced, but separate eyes. Vertebrate lenses (such as our own) can change shape (accommodate) to focus on objects at varying distances. Trilobite eyes, in contrast, had rigid, crystalline lenses, and therefore no accommodation. Instead, an internal doublet structure (two lens layers of different refractive indices acting in combination) corrected for focusing problems that result from rigid lenses. The shapes of some trilobite lenses, in fact, match those derived by optical scientists over 300 million years later to answer similar needs. Compare, for example, the optical designs of the 17th century physicists Descartes and Huygens shown below, with those of two trilobite species. The result is that, even without the benefit of accommodation, the rigid trilobite doublet lens had remarkable depth of field (that is, allowed for objects both near and far to remain in relatively good focus) and minimal spherical aberration (distortion of image). Light ray paths (yellow) entering the lens from the left come into focus a short distance to the right of the lens (blue). In the eye of Crozonaspis, an intralensar body (white) further corrects focus after passing through the outer lens layer (blue). * I use the term "design" as a lead-in to the parallels between the optic designs of humans and the remarkably evolved morphology of trilobites. Trilobites provide some superb examples of evolution in action (see "loss of eyes" below). 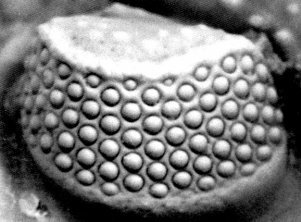 Trilobites make it quite clear that evolution of eyes occurs, and that one does not need to evoke "intelligent design" by a creator to explain them. To do so detracts from the idea of an omniscient being. It would have God tinkering with many flawed and suboptimal "designs" and never developing a perfect one. Who would want to worship a god like that? I mention this because this page has been used (without my permission) by people espousing "intelligent design" to the public, and I want it to be clear that I do not share those opinions, nor need that flawed argument to underpin my beliefs. Evolution is a remarkable and well-documented process, and breakthroughs in our understanding of its intricacies occur every year. Evolution is not in conflict with religious belief. Ignorance and intolerance damage the benefits of faith. There are three recognized kinds of trilobite eyes: holochroal, schizochroal, and abathochroal. The first two are the major types, with the great majority of trilobites bearing holochroal eyes, and the distinctive schizochroal eye a recognized innovation of the suborder Phacopina. Holochroal eyes are characterized by close packing of biconvex lenses beneath a single corneal layer that covers all of the lenses. These lenses are generally hexagonal in outline and range in number from one to more than 15,000 per eye! Schizochroal eyes on the other hand are made up of a few to more than 700 relatively large, thick lenses, each covered by a separate cornea. Each lens is positioned in a conical or cylindrical mounting and is separated from its neighbors by sclera (cuticular exoskeleton material) that extends deeply, providing an anchor for the corneal membrane, which extends downward into the sclera, where it is called intrascleral membrane.The abathochroal eye (Jell 1975) is seen in only a few Cambrian trilobites and is somehat similar to the schizochroal eye, but differs in some important respects: the sclera is not thick, and the corneal membrane does not extend downward, but ends at the edge of the lens. The table below illustrates and contrasts the characters of the three eye types. How did schizochroal eyes evolve? All early trilobites (Cambrian), had holochroal eyes and it would seem hard to evolve the distinctive phacopid schizochroal eye from this form. The answer is thought to lie in ontogenetic (developmental) processes on an evolutionary time scale. Paedomorphosis is the retention of ancestral juvenile characteristics into adulthood in the descendent. Paedomorphosis can occur three ways: Progenesis (early sexual maturation in an otherwise juvenile body), Neoteny (reduced rate of morphological development), and Post-displacement (delayed growth of certain structures relative to others). The development of schizochroal eyes in phacopid trilobites is a good example of post-displacement paedomorphosis. The eyes of immature holochroal Cambrian trilobites were basically miniature schizochroal eyes. In Phacopida, these were retained, via delayed growth of these immature structures (post-displacement), into the adult form. As with other aspects of the trilobite body, there was a huge variation of size and form among trilobite eyes, which in many cases seems related to the ecological life style of different species. The figures below show some of these variations. 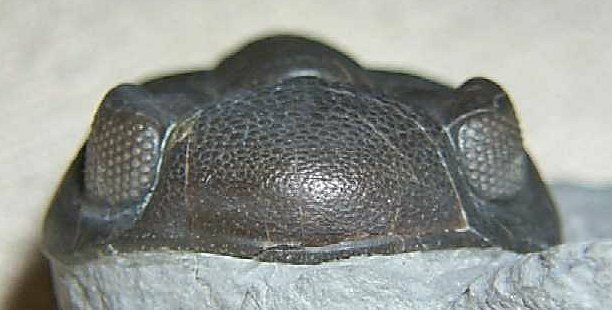 Many of the earliest trilobite eyes were cresentic, such as those of the Corynexochid Polypleuraspis. A conical section of schizochroal eyes gave species such as Phacops an excellent field of vision. In some trilobites, such as the free-swimming pelagic trilobite Opipeuter, the eyes were so large that they dominated the cephalon, providing a 360 degree visual field. Specialized forms, such as Agnostus, seem to have been entirely blind. Others, such as the Trinucleoid Cryptolithus were bottom feeders with a large, pitted sensory fringe, and eyes were reduced or lost. In species moving through a benthic layer of loose debris or algal growth, eyes raised above the body on stalks could peer about for danger, such as in the strange Russian Asaphoid Neoasaphus (left). Species living on the bottom in deeper waters would have little or no need for eyes at all, and species with reduced eyes, such as Trimerus and secondarily lost eyes, such as Conocoryphe are the result. Although eyes are normally an extremely important survival feature, there are situations under which loss of eyes might occur. For example, trilobites that took advantage of deep-water benthic (bottom-feeding) habitats where light was dim or lacking might have gradually lost their eyes without suffering an adaptive disadvantage. 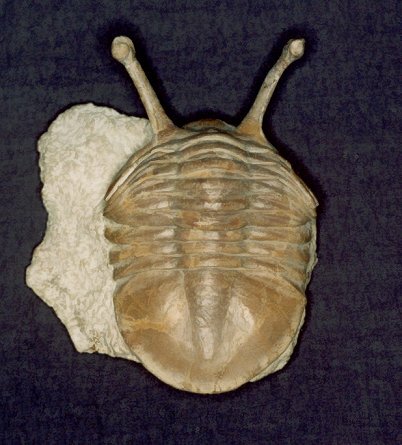 Such eyeless trilobite assemblages are called atheloptic. Such evolutionary trends are repeatedly seen in a variety of trilobite orders, and two examples are shown below. 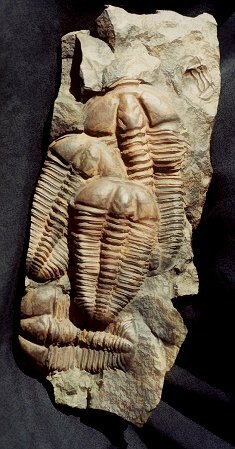 In both cases, these are Devonian trilobites that started with ancestors bearing large, functional eyes. In one sequence, eyes of a phacopid clade were lost, and facial sutures associated with eyes were also reduced and marginalized. In the other example, involving a proetid clade, eyes were also reduced and lost, but the basic facial suture pattern was retained. In the figures below (after Fortey & Owens 1999, citing Feist 1995), the eyes are shown in blue and facial sutures in red. The image to the left is a remarkable multiple of Conocoryphe sulzeri, a secondarily eyeless ptychopariid from the Czech Republic. The proetid Pterocoryphe had large eyes associated with opisthoparian sutures. Reduction of eyes and a migration forward on the cephalon is seen in the descendant Cryphops. Greatly reduced eye size marked the genus Pteroparia, descendant of Pterocoryphe. Eventually the eyes were lost althogether and the sutures were left along the anterior margin of the cephalon in the genus Trimerocephalus. Although the eyes are entirely lost in this Pteroparia species, the facial suture patterns are largely unchanged. In September 2003 Fortey and Chatterton reported on a remarkable trilobite: Erbenochile erbeni, a Moroccan acastoid with an extremely well-developed schizochroal eye borne on tall, columnar palpebral lobes, rimmed with an eyeshade. This is another recent documentation of a remarkable development of the optical organs in trilobites. Clarkson, E. N. K. 1975. The evolution of the eye in trilobites. Fossils and Strata 4:7-31. Clarkson, E. N. K. & R. Levi-Setti. 1975. Trilobite eyes and the optics of Des Cartes and Huygens. Nature 254 (1975): 663-667. Feist, R. 1995. Effect of paedomorphosis in eye reduction on patterns of evolution and extinction in trilobites. in: McNamara, K.J., ed. Evolutionary change and heterochrony: 222-44. Wiley, NY. Fortey, R.A., and B.D.E. Chatterton. 2003. A Devonian trilobite with an eyeshade. Science 301: 1689. Fortey, R. A. & R. M. Owens. 1999. The Trilobite Exoskeleton. in: Functional Morphology of the Invertebrate Skeleton. John Wiley & Sons. Jell, PA 1975. The abathochroal eye of Pagetia, a new type of trilobite eye. Fossils and Strata 4: 33-43. Levi-Setti, R. 1993. Trilobites (2nd Ed.). University of Chicago Press. Zhang, Xiguang & E. N. K. Clarkson. 1990. The eyes of lower Cambrian eodiscid trilobites. Palaeontology 33:911-932. The schizochroal eyes of phacopids have attracted research for over 150 years, and the arrangement and number of lenses in the holaspid eye has been subject to analyses exploring their utility in distinguishing between populations, species, and higher taxa, as well as the amount of variation that might be found within populations. Indeed, there are studies that have demonstrated that there can be differences between the number and arrangement of lenses between the two eyes on a single specimen! It was pioneers such as Steininger (1831) and Clarke (1889) that first diagrammed the arrangement of lenses and suggested that these might be useful in classification, but Clarkson (1966) who established the system of charting and counting dorso-ventral files (DVF) of lenses. The classic study of Niles Eldredge (1972) used DVF among other characters to distinguish the species and subspecies in North American Phacops rana and P. iowensis. He pointed out that P. iowensis invariably bore 13 dorso-ventral files, while P. rana, depending on subspecies, ranged from 15-18 DVF, with the most primitive subspecies, Phacops rana rana, bearing the largest number of files. 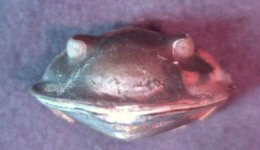 He concluded that P. rana and P. iowensis were only distantly related, a conclusion also reached by Struve (1990), who erected genus Eldredgeops and placed P. rana (but not P. iowensis) within it. Similarly, Campbell (1977) noted differences in the number and arrangement of lenses in the eyes of what he then called "large-eyed" and "small-eyed" morphs of Paciphacops raymondi from the Haragan formation in Oklahoma. Later, Ramsköld and Werdelin (1991) revised that complex, recognizing not only separate species, but assigning them to two different genera: Paciphacops campbelli, with eyes bearing DVF of only 3-4 lenses/file for the "smalled-eyed" morph, and Kainops raymondi, with 6-7 lenses per file for the "large-eyed" morph. Thomas, A.T. 2005. 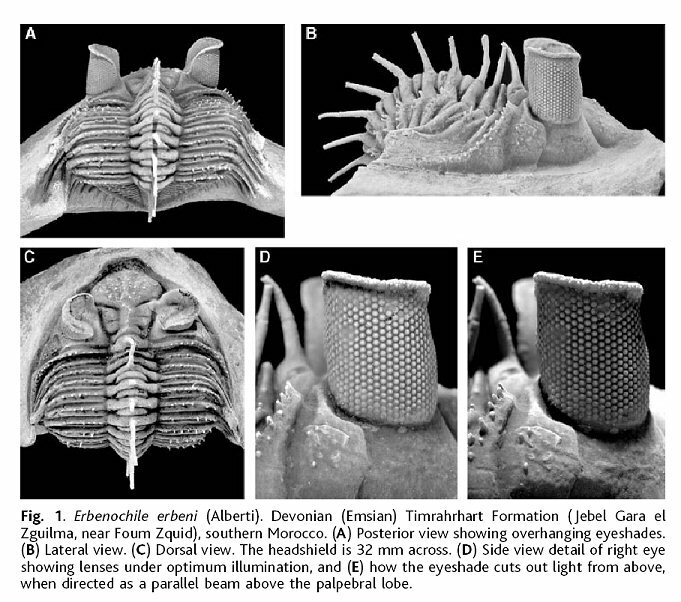 Developmental palaeobiology of trilobite eyes and its evolutionary significance. Earth-Science Reviews 71:77–93. Eldredge, N. 1973. Systematics of Lower and Lower Middle Devonian species of the trilobite Phacops Emmrich in North America. Bull. Am. Mus. Nat. Hist. 151:285-338. Eldredge, N. 1972. Systematics and evolution of Phacops rana (Green, 1832) and Phacops iowensis Delo, 1935 (Trilobita) for the Middle Devonian of North America. Bull. Am. Mus. Nat. Hist. 147:45-114. Steininger, J. 1831. Observations sur les fossiles du calcaire intermediaire de l'Eifel. Mem. Soc. Geol. France 1(15):331-71. Struve, W. 1990. [Paläozoologie III (1986-1990)]. Courier Forschungsinstitut Senckenberg 127: 251-279.
from his superb book "Trilobites"